Expert nutrition through all of pregnancy. A careful balance of 19 vitamins & minerals. Iron, zinc, vits. D & B12 and folic acid (400µg). UK's no. 1 pregnancy brand. The Queen's Awards for Enterprise Innovation 2013. Gluten free. Free from preservatives, artificial colours, lactose, salt, yeast and gelatin. Pregnacare is not tested on animals. Suitable for vegetarians. Food Supplement Expert nutrition for mother and baby Worldwide studies have shown that additional levels of nutrients such as folic acid and vitamin D are important before and during pregnancy. Pregnacare® has been carefully developed to help safeguard dietary requirements, from the start of trying to conceive and throughout the whole of pregnancy. More than folic acid Formulated by Vitabiotics' experts with 19 important vitamins and minerals. With 400µg folic acid, the exact daily level recommended by the UK Department of Health. Recommended 10µg Vit. D The UK Department of Health recommends all pregnant and breast-feeding women take a daily supplement containing 10µg vitamin D. Trusted support for mums Pregnacare® helps to support all round health and wellbeing, with folic acid which contributes to maternal tissue growth during pregnancy. The unique formula also includes zinc which contributes to normal reproductive health. Effective support without excessive levels To protect your growing child, Pregnacare® avoids excessive levels of iron and other nutrients. 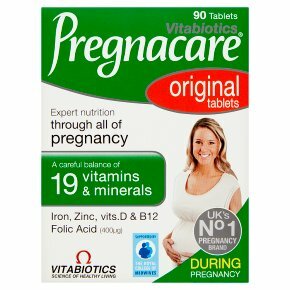 Pregnacare® does not contain vitamin A, as high levels are not advised in pregnancy. Directions One tablet per day, with your main meal. Swallow with water or a cold drink. Not to be chewed. Do not exceed the recommended intake. To be taken only on a full stomach. You can take Pregnacare® during all stages of your pregnancy. This comprehensive formula replaces other Pregnacare® multivitamins. There is no need to take an additional multivitamin. Food supplements must not replace a varied and balanced diet and a healthy lifestyle.<br>As with other food supplements, consult your doctor or pharmacist before using if you are under medical supervision, have epilepsy, a thyroid condition, haemochromatosis, suffer from food allergies, or are allergic to any of the ingredients.<br><br>As Pregnacare® contains vitamin K, if you are taking oral anticoagulants (e.g. warfarin) do not take Pregnacare® except on the advice of a doctor.<br>This product contains iron, which if taken in excess, may be harmful to very young children.